When did we start believing that God wants to send us to safe places to do easy things? Jesus didn't die to keep us safe. He died to make us dangerous. The will of God is not an insurance plan; it's a daring plan. It's time to quit living as if the purpose of your life is to arrive safely at death. 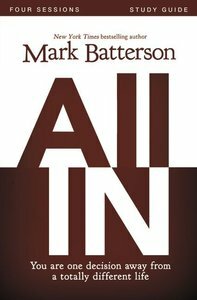 All In, a four-session video-based Bible study by New York Times bestselling author Mark Batterson, challenges participants to resolutely follow God wherever he leads by pointing out that if Jesus is not Lord of all, he is not Lord at all. Most people think they are following Jesus. They may think they are following Jesus, but the reality is, they've invited Jesus to follow them. They call him Savior, but they've never surrendered to him as Lord. Are you following Jesus? Or have you invited Jesus to follow you? Participants will find Batterson's teaching filled with his customary vivid, contemporary stories as well as biblical characters like Shamgar, Elisha, Jonathan, and Judas. It's time to go all in for God. A companion study guide (sold separately) is also available. About "All in (Study Guide)"